I tend to stay away from most styling products. They weigh my hair down, make it greasy and unmanageable, and generally tend to make my life miserable until I wash all evidence of them down the drain. Not so with Kérastase Elixir Ultime. This unsuspecting serum has miraculously changed my hair life for the better -- and I'm now singing its praises from the rooftops! Elixir Ultime contains a cocktail of emollient and antioxidant active ingredients (using the brand's Oléo-Complexe Technology with Maize Oil from Central America) that promote shine, suppleness and cellular renewal. It nourishes and conditions the hair with Pracaxi Oil, smooths the fibers with Camellia Oil harvested from Asia, and both restores strength to the hair and protects it from external aggressors with Argan Oil from North Africa. I've found that using two pumps on damp hair before blowdrying results in shiny, silky strands that last for days on end with absolutely no greasy residue. It's a true miracle! 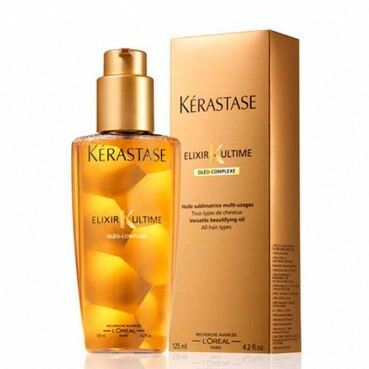 Kérastase Elixir Ultime retails for $54 at drugstore.com. I purchased this item due the all the positive reviews. Since the product is rather pricey, I figured it was probably all it claimed to be. Wrong. I am not overly crazy about the product. Okay, as a pre-treat before washing, but I don't like it as a smoothing agent on dry hair. I've used other anti-frizz/smoothing products that I like a lot more (KMS for one). For all the hype this gets, I'll give it 2 stars. Thanks for your comment! I would actually not recommend using it on dry hair -- this is a product to use as a smoothing agent pre-blowdry. On dry hair, it would make it too greasy. But thanks for your suggestions and feedback! I've read a million reviews of this product, all of which are glowing, but I just can't get down with silicone and corn oil as the main ingredients. Not for $50. Pracaxi, camellia and argan oils are all awesome, but they're listed after "maize," aka corn. I'm glad it's working well for you, but I'd rather buy the good oils and mix them with silicone. Buy the Suave Professionals Keratin Infusion Smooth and Shine Serum instead. It works just as well for me, but only costs $2.50 for a bottle. The only difference I've noticed (besides the price) is the Kerastase smells wonderful and the Suave just smells okay. Not enough reason to pay $50 for an otherwise identical product.